The cordon on Lincoln Road. Eugerindo Nhaga, 21, of Croyde Avenue, was charged with wounding with intent, possession of a weapon in a public place and violent disorder. A man in his 20s received serious but not life threatening injuries and was taken to Peterborough City Hospital after the incident in Lincoln Road at 12.15am on Wednesday May 18. 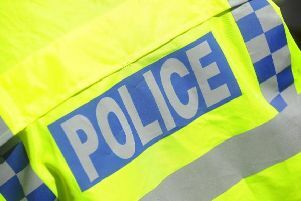 Estefane Balde, 24, of Hampton Court in Peterborough and Nelson Mendes, 20, of Lowick Gardens in Peterborough have also been charged with wounding with intent and violent disorder. All three appeared at Cambridge Magistrates Court yesterday (May 19) and were remanded in custody to appear at Peterborough Magistrates Court on June 16. Six men were arrested after the stabbing, which took place between Geneva Street and North Street. A 21-year-old man from Peterborough has been bailed to Thorpe Wood police station on June 15. A 25-year-old of no fixed abode has been bailed to Thorpe Wood police station on June 15. A 45-year-old man from Wisbech has been released with no further action. Anyone with information should call the police on 101 or Crimestoppers anonymously on 0800 555111.